HOUSTON (AP) Stephen Curry is well aware that Houston Rockets general manager Daryl Morey has crafted his team specifically to try and beat the Golden State Warriors. But on Thursday night with the Rockets missing the most important piece on their team in James Harden, Chris Paul and his supporting cast were not enough to overcome the defending champions. Curry scored 29 points, Klay Thompson had 28 and the Warriors pulled away late in the fourth quarter for a 124-114 victory. Draymond Green added a triple-double with 17 points, 14 rebounds and 10 assists to become the franchise career leader in triple-doubles with 21. It was his second this season to move him past Tom Gola. The Warriors extended their road winning streak to nine games and have won an NBA-best 16 road games this season. The teams stayed close through most of the game, but the Warriors had a seven-point lead with about 3 1/2 minutes left. They scored the next five points, highlighted by a 3 from Curry, to make it 120-109 and send many of the home fans streaming for the exits. The Rockets got 30 points from Eric Gordon, and Gerald Green came off the bench to score 29 and tie a career high with eight 3-pointers as they played their second game without Harden, who is out for at least two weeks with a hamstring strain. The Warriors were short-handed, too, playing without Kevin Durant, who missed the game with strained right calf. But Andre Iguodala returned after sitting out Wednesday night with back and hip strains and had 10 points and eight assists. ”Obviously they were missing their best player without James so we felt like there was an opportunity for us,” Thompson said. Curry added nine rebounds and five assists and a steal in his third game back after missing 11 with a sprained right ankle. Golden State led by 10 after a dunk by David West with about 7 1/2 minutes remaining. 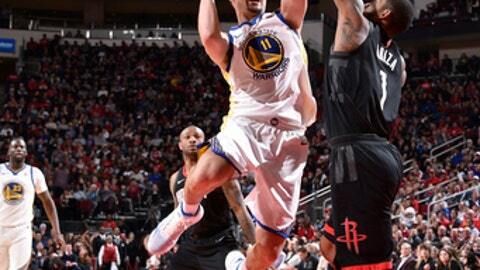 The Rockets scored the next five points, with a 3-pointer from Gerald Green, to get to 108-103, but the Warriors scored the next five points to go up by 10 again. The Warriors were up by 3 after three and opened the fourth quarter with an 8-1 run to make it 101-91 with about 10 minutes left. Chris Paul re-entered the game after that and he helped get things going when he found Gordon for a 3-pointer which started a 7-2 run that cut the lead to 103-98. Paul finished with 28 points, nine assists and seven rebounds. Gerald Green’s second 3-pointer in less than a minute put Houston up by two midway through the third quarter. The Warriors scored the next seven points, with a 3-pointer from Thompson, to take a 79-74 lead about a minute later. They didn’t stay on top for long though as the Rockets scored the next 11 points to go up 85-79. Gerald Green delighted the crowd when he knocked down a 3 from the corner before being fouled Iguodala and crashing to the ground. He also made the free throw. The Warriors ended a 2 1/2 minute scoring drought on a dunk by Kevon Looney before Curry added a layup. But Gerald Green pushed the lead to 88-83 when he banked in another 3-pointer. The Warriors closed out the quarter with a 10-2 spurt, capped by 3s from Nick Young and Curry, to take a 93-90 lead into the fourth quarter. The Rockets led 63-62 at halftime. Warriors: Omri Casspi missed his second straight game with a strained back. … Curry played in his 600th career game with the Warriors, making him the 10th player in franchise history to reach that mark. Rockets: Nene normally doesn’t play the second game of back-to-back games but was also dealing with a bruised right knee that coach Mike D’Antoni could cause him to miss more time. … Paul received a technical foul in the fourth quarter. R&B singer Usher watched the game from a courtside seat next to Golden State’s bench and got involved in the action when he caught Trevor Ariza and Curry as they sailed out of bounds and into his seat chasing a loose ball in the third quarter. Usher put his hands up to protect himself as they barreled his way and laughed as he collected himself after the two players got up. Gerald Green became the first player in franchise history to make seven or more 3-pointers in consecutive games after he made seven on Wednesday night against Orlando. Golden State coach Steve Kerr raved about the work of Green, who was signed on Dec. 28.